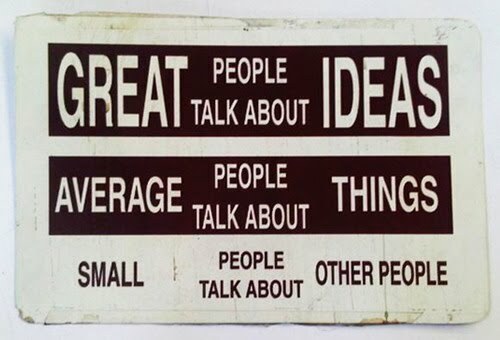 Small people talk about other people (celebrities, themselves). Average people talk about things (current events, politics, what's for dinner, their son's soccer game). Out in the southern California desert lies a conference unlike one you've ever been to before. Where world-shaking ideas are shared, incredible game-changing innovations witnessed on ceiling-mounted flat-screens from the comfort of beanbag chairs, and then discussed at the end of the day around fire pits by the pool. It's a a week-long electrifying confection of big ideas with some of the most optimistic and insightful people you'll ever meet. And it's happening again February 25 to March 1. You know TED. You've probably heard the name, watched one, or a dozen, or a hundred TED Talks online. And if you don't know what TED is, go over to TED.com right now and watch a few TED Talks because you're missing out on some of the biggest ideas ever discussed and some of the most engaging conversations of your life that will open your eyes to massive ideas you've never even thought about, or expand on ones that you have. But see, here's the thing: TED is so much more than just the 18-minute videos you see online. If you've never actually attended TED, you're missing out on one of the best experiences in the world for those who plan to move and shake the world. Or even just those who want a little more intellectual excitement in their life. Every year, TED's main event is held in Long Beach, California (moving to Vancouver, Canada starting in 2014) where the world's elite gather to watch and discuss the biggest ideas being shared. The price to attend TED is $7,500 per person, and you have to be accepted based on your credentials before they'll even take your money, ensuring the highest caliber of fellow attendees. The price is worth it, but there's another event, a sister event of TED where the real party is at. It's called TEDActive and runs simultaneously 100 miles away in Palm Springs. In a sentence, TEDActive is the less expensive version of TED (just $2,500 per person) where you watch everything that's happening over at TED in Long Beach live via simulcast. Sound kind of boring to watch on a screen and not in-person? It's not. In fact, it's at least triple the fun. Here's why. TEDActive is unlike any other conference you've ever been to because every single detail of the week-long event -- from the venue, to the activities, to the food, to the people, and all the way down to the name tags -- is expertly designed and choreographed to encourage a level of organic engagement that I've never witnessed at any other event. They design the environment in such a way that you feel comfortable going up and talking to anyone, about just about anything. At most events, you have to work up some level of courage to do that. Not at TEDActive. They takeover the host resort so you know right off the bat that anyone you walk up to is going to be there for exactly the same thing you are. The food is fantastic, and drinks and snacks are available at any time during the entire day from a number of different of snack stations -- and it's all free, so you just grab it and go. What about that awkward first meal at most events where you usually grab a plate and eat by yourself? At TED2012, everyone got a random number and TED setup picnic baskets and blankets on the grass lining the walkways. You'd find the picnic basket with your number, sit down, and make instant friends. Even the giant oversized name tags were designed for starting conversations. On them they have you list three different topics for people to talk to you about. Kind of hard not to know what to talk about with someone you've never met when they're wearing three topics they'd love to chat about. The whole thing is so fantastically open that even the introverts manage to become extroverts here. Since the whole resort was booked by TED, you know you can approach anyone you're looking at and go chat them up or just sit down at one of the empty seats around a firepit and join a conversation already happening. And the conversations are real; about how we're experiencing life, where we're struggling, what we're excited about, how we can help each other. At night, the fire pits became a ritual that by the last night we would all deeply miss. All of the TEDsters would gather around them surrounding the massive outdoor pool to discuss the day's sessions. During the day, you can watch the live talks piped into the main ballroom, or out in a cabana by the pool, or in the creative lounge. You don't have to be in one place the whole time to get the most out of the event. You can be in any number of comfortable spots all around the property and still take in everything. And the people? That's why you throw $2,500 on your credit card and go. If it weren't for the caliber of the people who attend TEDActive (not anyone can get in -- like TED in Long Beach, you must apply and be accepted, but it's a bit easier to get approved), you could just watch 90 percent of the TED Talks online anywhere from a few days to a few months after the event (they are uploaded gradually). But the yellow brick road only goes so far on your own. You can only bounce an idea around so many times in your own head before the idea can't grow anymore. That's because your thoughts are the sum of your experiences, and despite how vast, those experiences are finite. TED brings together people from all over the world who have said "yes" in their life more than they have "no" and cultivated a bank of as many or more unique experiences as you have, which makes these people some of the best sounding boards in the world. Getting in a room with other thinkers and combining their perspectives, ideas, insights and imaginings with your own is what transforms ideas into big ideas that shake the very foundation of your own thinking and maybe even change the world. There are talks which, after you listen to them, you feel compelled to instantly seek out somebody who heard it to talk more about it. You can't do that behind your computer screen. Bottom line: watching the talks is only half of the equation. It's just as, or even more important to come discuss the ideas and have a conversation about it. TEDActive is where those conversations happen. You go to a TED conference for the people. And for the experiences you could never have behind your computer screen, like sitting next to a random person on a bus back from one of the parties and learning that he vacationed almost a dozen times with your #1 hero, Steve Jobs. You'll meet some of the most progressive, forward-looking intelligent people who have a positive outlook about life. The energy and passion is unbelievable, and not in a bunch of idiots jumping around for joy singing a ridiculous song kind of way. TEDActive isn't a business conference. People aren't here to pitch their business. They come to make friends with like-minded individuals and then if you're both having a good time, eventually the other person is going to ask what you're up to. Business may (and usually does) happen along the way, but it's not presumed here. As a writer for some pretty big publications, it was nice for once to not even have a single person during the entire week try to push their business at me trying to get a story out of it. The people who come to TED Active are authentic. There's no hidden agenda. During one of my nightly fireside chats, I commented to a few new friends about how refreshing it was to be around people who think big and appreciate big ideas. And John Ohanian quickly snapped back "or just think." Wise words. The people here at TED think. They don't let the thoughts of others walk over them and permeate their mind without deliberate thought as so much of the world oppositely does. TED is a conference for outcasts. It's like Disney World for progressive thinkers. And TEDActive is that, plus a giant party (but for adults). And the fact is, TED in Long Beach simply isn't this much fun. It's much more business-like. You don't have the who's who of the business world at TEDActive like you do TED Long Beach, but the exhilarating environment, late-night parties at ridiculous mansions, and nightly fireside chats don't exist in Long Beach in quite the same way. The energy is very different. At TEDActive, ego is nonexistent and it's a family-like environment among 700-plus people like you wouldn't believe. TED Active is much more of a party than Long Beach. In one sentence, it's just a whole lot more fun. And the terrific hosts, Rives and Kelly Stoetzel, contribute to that ambiance with their energy and playfulness in the perfect way. If you're at a point where you need to network with the heavy-hitters though, Long Beach is where you want to go. There aren't many events where you can walk into the bathroom during a break and be at the sink with Sergey Brin and then at the very next break be chatting at the sink with Jeff Bezos. If you want to rub shoulders with the world's elite and expand your mind, go to TED Long Beach. 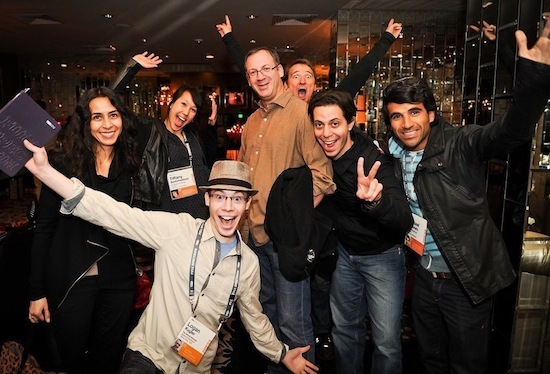 If you want to have extraordinary fun in a deeply creative environment, make life-long friends, and expand your mind, go to TEDActive. But regardless of which one you attend, you'll hear the same extraordinary 18-minute talks, of which many of the speakers spend months preparing for. There is arguably no more prestigious stage than TED and the elite experts who are invited to speak come to TED knowing that they're expected to deliver the biggest talk of their life, and it usually shows in the end result. Last year, we saw flying quadrotor robots that can be programmed to fly in impossibly close and intricate formations, the implications of which are astounding from being able to digitally map the interior of massive buildings in just a matter of hours, to search and rescue utility, to developing low-Earth orbit, etc. From Brian Greene, theoretical physicist and PBS NOVA host, we heard about just how big the universe is believed to be, and how many other universes might exist. But I think the best talk of TED 2012 was Regina Dugan's speech about doing the impossible in which she gave example after example of extraordinary projects of past and present where just before success the experts said it was impossible: airplanes, the sound barrier, space travel, landing on the Moon, the Internet, thought-controlled robots, etc. In her talk, Dugan, then director of DARPA (Defense Advanced Research Projects Agency) and now an executive at Google, said "In 1885, Lord Kelvin declared that heavier-than-air flying machines were impossible. In October of 1903, the prevailing opinion of expert aerodynamosis was that maybe in 10 million years we could build an aircraft that would fly. And 2 months later, on December 17th, Orville Wright powered the first airplane across a beach in North Carolina." Dugan encouraged us to defy the impossible and asked "What would you attempt to do if you knew you couldn't fail?" Going to an event like TED is what it means to be alive; engaging, conversing and sharing ideas with other brilliant people who question things. This is the conference you come to where the conversations don't end once the conference is over. You make lifelong friends from all over the world who invite you into their home to continue the conversation the next time you're in their town. You go home with a new group of friends who become your board members, advisors, travel buddies, etc. TEDActive is way more than a conference. It's a place where ideas (and people) come alive. At every opportunity, sit next to somebody who you don't know. Be open. Come as a totally open slate. And say "yes" to every opportunity. Be ready for anything. Be present. Be vibrant. Be alive.